St. John the Much-Suffering is a saint who fought industrial-strength sexual temptation for decades and WON in every sense of the term. St John the Much-Suffering pursued asceticism at the Kiev Caves Lavra, accepting many sorrows for the sake of virginity. The saint prostrated himself and said: “Lord! Why did You leave me for so long in torment?” “I tried you according to the power of your endurance,” was the answer. “I brought upon you temptation, so that you might be purified like gold. It is to the strong and powerful servants that a master assigns the heavy work, and the easy tasks to the infirm and to the weak. Therefore pray to the one buried here (Moses the Hungarian), he can help you in this struggle, for he did greater deeds than Joseph the Fair” (March 31). The monk died in the year 1160, having acquired grace against profligate passions. His holy relics rest in the Caves of St Anthony. I have had a great devotion to St. John, enough that I commissioned the icon pictured, not only so that I would have the icon pictured (and after it touched the relics of the singularly triumphant St. Mary of Egypt (life story, icon) and St. John’s own relics. 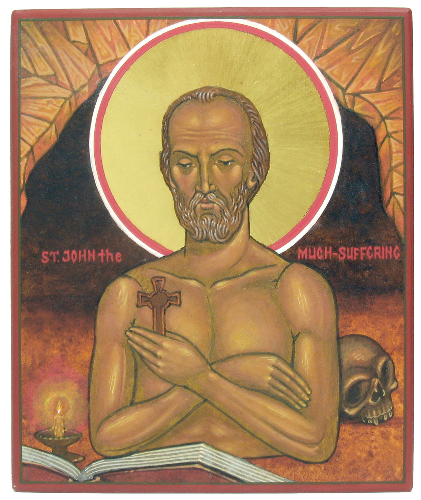 But I asked and received permission to show St. John the Much-Suffering from my website, and so this page has a copy of the icon, which you can see by scrolling up. There are two buttons, “BIGGER” and “smaller”, and you can use them to adjust the size, then print the icon out and attach it to a board. I apologize for the crudity of this method, but St. John is a treasure, I think an icon of him has been needed since long before I placed my order, and he is particularly relevant now. St. John the Much-Suffering is a powerful intercessor for praying for your own struggles. St. John the Much-Suffering is also a powerful intercessor for praying for others who are tempted along with praying, in the spirit of “I am the chief of sinners,” for mercy and one’s own purity. Triumph over powerful temptation is possible!